It's time for the New Product Launch! All the Stamps, Die-namics, and Stencils can be found HERE. Please remember to visit each of the MFT Designers' February New Product Launch posts on the MFT Blog and leave a comment by the end of the day on Thursday, February 9 for your chance to WIN one of two, $100 Gift Vouchers. Ready? Set. Comment! I have a fun trio of projects to share with you today. 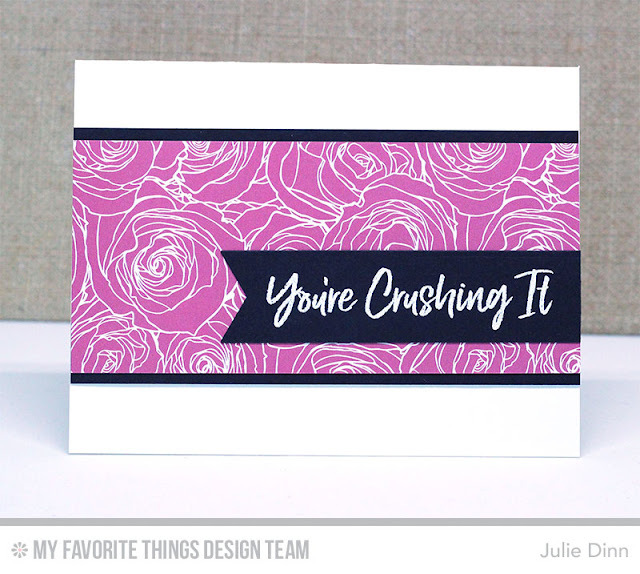 They were created with the new Boss Babe stamp set, Wine Tag Die-namics, and the gorgeous Roses All Over Patterned Paper. I LOVE this new paper pack! I have a feeling that I will be using it over and over again. 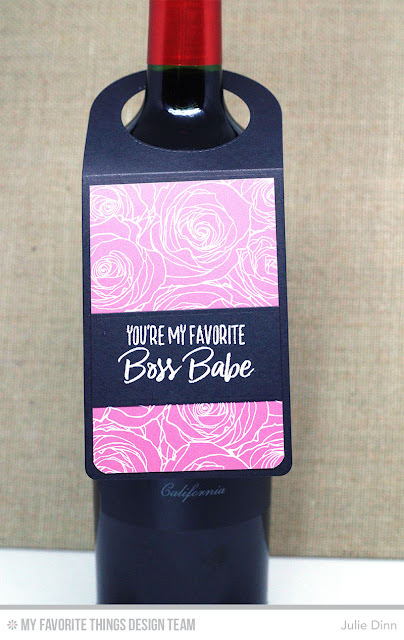 I stamped the sentiment from the Boss Babe stamp set on Black Licorice card stock with Versamark and I embossed the sentiment with White Embossing Powder. I created a small gift box using my Score Buddy and Black Licorice card stock. The circle cut out from the Wine Tag was the perfect size for a tag on the box. I finished it off with a bow. Love the little gift box ... the floral paper is so nice and pretty! Love the rose patterned paper. The colors are fabulous. Love the card and the wine tag. What a great way to showcase that paper. Thank you for the inspiration! I agree with Laurie -- you did a great job showcasing that beautiful paper! I love your projects. The black and purple colors look fab together! I love the bow on the box. You picked perfect sentiments. Thanks for sharing. Just love your style. Wow factor! Love everything about the gift box. The contrast of the hot pink against black is so fun. What a great collection. I especially love the small gift box. Gorgeous color combo. Love the new pattern paper and the sentiments are amazing! What great inspiration, good to see what else can be created from our crafty goodies. Fantastic gift set. I have to admit I'm a little in love with the roses all over papers. What a fun gift set! WOW!! What a fabulous trio!!! I love love love this set Julie! Wow! So elegant!! That lovely paper jazzes things up so easily!! Love that paper!! It looks awesome with the black card stock & white sentiments!! Amazing set. Love the bright colors with the black and that rose paper. Swoon!! Wowza, what a Fabulous set. It's a great way to present a gift. Bravo! Wow!!!! Love your gorgeous projects!!! The small gift box and the colors are absolutely stunning!!! Very pretty with this rose patterned paper. I love all your projects you have put together!!! And all the colors you used are so pretty!! Very pretty projects! Love the patterned paper you used and your sentiments! love the pink against that black licorice. Very striking! love all your fun projects!! Wow, the pink against the black looks stunning here. Fabulous projects! Lovely choice of colors! "Boss Babe" ROCKS! Thank you for sharing! Love this style and the colours you've used. Beautiful set! The color combo is stunning and that little box is soooooo adorable! Love these on the colors! Super pretty paper stack for these fun projects! Beautiful ensemble! Love the roses paper! These are so pretty because they are made with the new Roses All Over Papers. They add such a beautiful touch, but are much easier and faster than stamping the pieces. Beautiful! Love the tags and how you wrapped it around that gift box! I love the flower background! Beautiful ensemble. Love the pink and black together. love this set!! the colors together are great. Great use of multiple products to create a classy look. Gorgeous! I love the colors so much. At first I didn't think I needed this stamp set, but after seeing all the sentiments used individually on everyone's great projects I now have a need! Fabulous projects! 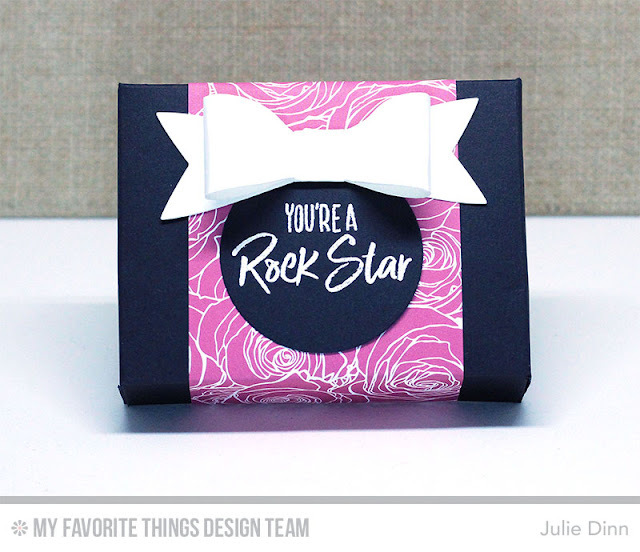 Love these fun sentiments and that gorgeous paper! I'm a huge fan of pink and black (as you can see on my blog lol), so obviously I love love these projects! Love the pink and black color scheme. This new paper packet is beautiful! Great collection of projects! CAS! Very nice effect with the new pattern paper!